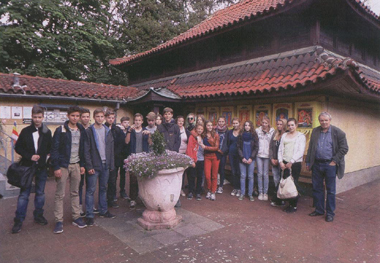 On 11th May 2014, a Vesak celebration and alms giving took place at the Buddhist Temple ( Das Buddhistsiche Haus) in Berlin – Frohnau organized on behalf of the German Dharmaduta Society, Colombo, by Mr. Tissa Weeraratna, Vice-President of the Society, with the co-operation of the Sri Lanka Embassy in Berlin. Ven. Santharakkhita Thero of the Buddhist Temple in Berlin (Das Buddhistische Haus) and Ven Pallegama Vijitha Thera of the Sri Lanka Buddhist Pilgrims Rest,New Delhi took part in the ceremony. Members of the Sri Lankan community living in Berlin, Hon. 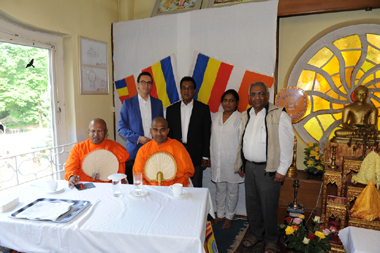 Sarath Kongahage the Ambassador of Sri Lanka for Germany, Members of the Embassy staff and Germans of Buddhist faith participated in the celebration. Ven. Santharakkhita Thero, Ven Pallegama Vijitha Thera and Mr. Tissa Weeraratna elucidated the meaning of the Triple festival of Vesak commemorating the birth, enlightenment and Parinirvana of the Buddha in their Dharma Deshaneya. Ambassador Sarath Kongahage stated in his brief address to the participants that Buddhism was a religion of humanity, kindness, and equality. It has strived to promote peace and harmony among men and had the best record of being a truly peaceful religion in human history. Due to this fact, Buddhism was growing fast in many countries and attracting many followers, he added. 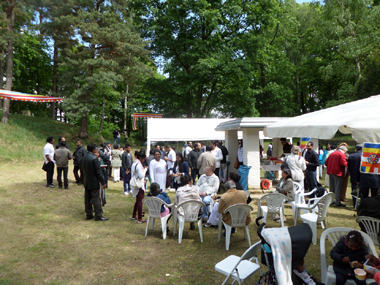 The Embassy of Sri Lanka premises in Berlin were also colorfully decorated with Buddhist flags, illuminations and lanterns for the Thrice Blessed Day. The Ambassador and members of the embassy staff made religious observances on the Wesak day at the `Buddhu Madura` situated in the Embassy premises. seen seated at the Table. This entry was posted on Saturday, May 24th, 2014. You can follow any responses to this entry through the RSS 2.0 feed. You can skip to the end and leave a response.